In the past, companies could pick a strategy and stick with it, maintaining a competitive edge for years. But today, companies surge ahead, fall behind, or even disappear in mere months. If you and your company are going to thrive for the long run, you need to continuously evolve, change, and stay a step ahead of your competition. The ability to see and capitalize on new opportunities is the cornerstone of agility. Successful technology-based firms like Google, Tesla, and Amazon have all mastered agility within their core business practices, but companies in any sector can—and must—learn to spot new opportunities and make the right choices about what to invest in, what to change, and what to abandon. Market agility: Gain ideas from your most demanding and forward-thinking customers and from outside your industry. Engage, observe, and mix with customers to identify the opportunities created by their changing demands. Decision agility: Anticipate the changes that may affect you and turn even troubling trends into opportunities. Design your strategy to maximize learning and to manage risk. Generate diverse alternatives and make fast, fact-based decisions about which to pursue. Execution agility: Build new capabilities, shed what doesn’t fit, and take the first steps in a new direction. Experiment, then reinforce and build on what works. Enlist and inspire your organization around a compelling purpose and grant employees the autonomy and resources to continuously adapt and adjust course. The future will present more opportunities but narrower windows to capture them. 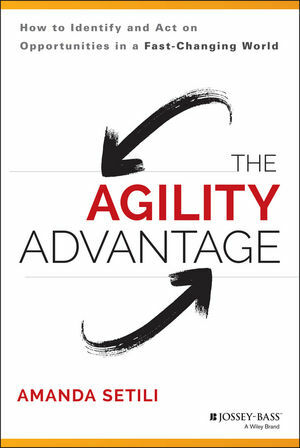 With a wealth of valuable information and practical strategies, The Agility Advantage is essential reading to help any organization adapt and thrive—both today and tomorrow. AMANDA SETILI is managing partner of strategy consulting firm Setili & Associates, whose clients include Coca-Cola, Delta Air Lines, The Home Depot, and Walmart. She previously held positions with McKinsey & Company and Kimberly-Clark, and served as an executive with two successful disruptive technology startups, in the United States and Malaysia. Setili is a graduate of Vanderbilt University and Harvard Business School and has taught as an adjunct professor at Emory’s Goizueta Business School. She lives in Atlanta, Georgia.